The Alpha Magnetic Spectrometer (link is external) (AMS) collaboration has today presented its latest results. These are based on the analysis of 41 billion particles detected with the space-based AMS detector aboard the International Space Station. The results, presented during a seminar at CERN, provide new insights into the nature of the mysterious excess of positrons (antielectrons) observed in the flux of cosmic rays. The findings are published today in the journal Physical Review Letters. 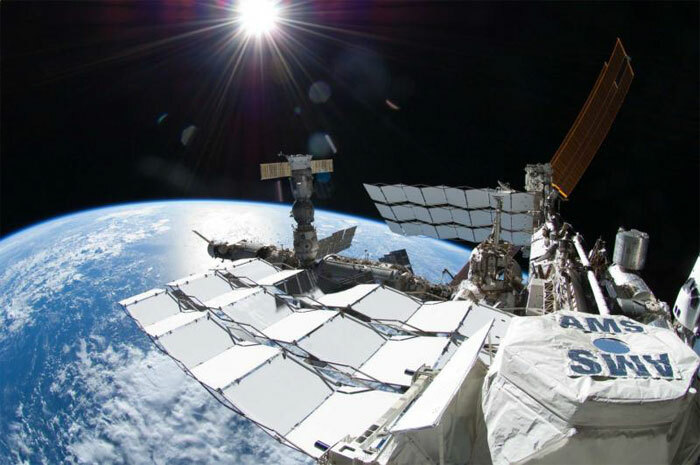 The AMS experiment is able to map the flux of cosmic rays with unprecedented precision and in the results published today, the collaboration presents new data at energies never before recorded. The AMS collaboration has analysed 41 billion primary cosmic-ray events among which 10 million have been identified as electrons and positrons. The distribution of these events in the energy range of 0.5 to 500 GeV shows a well-measured increase of positrons from 8 GeV with no preferred incoming direction in space. The energy at which the positron fraction ceases to increase has been measured to be 275±32 GeV. This rate of decrease after the “cut-off energy” is very important to physicists as it could be an indicator that the excess of positrons is the signature of dark-matter particles annihilating into pairs of electrons and positrons. Although the current measurements could be explained by objects such as pulsars, they are also tantalizingly consistent with dark matter particles with mass of the order of 1 TeV. Different models on the nature of dark matter predict different behaviour of the positron excess above the positron fraction expected from ordinary cosmic ray collisions. Therefore, results at higher energies will be of crucial importance in the near future to evaluate if the signal is from dark matter or from a cosmic source.